Dr. Kevin is a Board Certified Pediatric Dentist who successfully completed a rigorous examination process to be better qualified to care for your kids! When not goofing off with children in the dental clinic, you can find him hanging with his family. 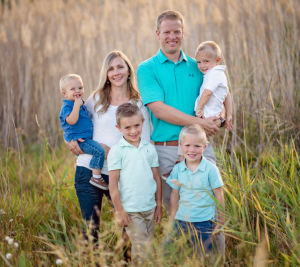 Dr. Kevin and his wife, Jenny, have four spirited boys, and together they love exploring all the outdoor fun Utah has to offer. As a family they love to camp, hike, ride bikes, ski/snowboard, boat, and do most anything outdoors. Dr. Kevin also loves to golf, watch Jazz basketball and is an avid Utah Ute fan. Go Utes! Dr. Kevin graduated from the University of Louisville School of Dentistry. It was during his pediatric rotations in dental school that he discovered his love for working with children, and decided to specialize in pediatric dentistry. Following dental school he completed a two-year residency in pediatric dentistry at Riley Hospital for Children in Indianapolis, IN. While in pediatric dental residency, Dr. Kevin also completed a Minor in Child Psychology. This specialized training enables him to use an individualized approach to help each child have a positive dental experience. His goal is to enable each child to have a fun, relaxing, and enjoyable dental experience. Dr. Kevin’s playful personality is a great asset with patients. He is passionate about his profession and enjoys calming fears and helping kids have a positive and rewarding dental experience. He is a strong believer in preventative care, and is dedicated to educating patients, parents, and the community about proper oral health care. Additionally, Dr. Kevin pursues continuing professional education, and utilizes the best and most current guidelines and treatments available. 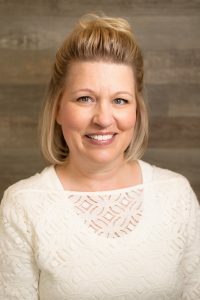 Jennifer graduated from the dental assisting program at Boise State University in 1992 and worked as a dental assistant in pediatric and general dentistry for several years. After moving to Utah in 2005, she began working in dental administration. 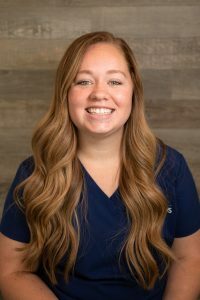 Her favorite part about patient care is interacting with our young patients and their families, and finding ways to help them best understand their dental care options. She and her husband have three adult children and one son-in-law, a miniature pincer named Shawn, and a labradoodle named Shepard. She loves music and playing piano, baking (not cooking), Pinterest, quilting, crafting, looking at stars and eating smores around a campfire, and spending time with her family laughing and having fun! Maggie graduated from dental assisting school in 2017 and has worked as a pediatric dental assistant ever since. She has always known she wanted to work with children. She has experience working with kids with Down Syndrome and other special needs. She appreciates their differences and understands they need more time and is able to think outside the box to make their visit successful. She loves the joy and sense of adventure kids bring into her work. Her favorite part about working in pediatric dentistry is being able to help the kids feel safe, comfortable and enjoy their experience at the dentist. Maggie married her husband Jake in November of 2016. They have a Bernese Mountain dog named Lyla. She is the second oldest of eight siblings. She loves to binge on a good TV show, late night snacks, playing pickle ball and soccer, spending time with her family, and she thinks she’s hilarious.